In early 1993, at the age of eighty, Brian Johnston embarked on a nationwide theatre tour with his one-man show called 'An Evening with Johnners'. The tour was a sell-out and a recording of one of the shows became a number one bestseller, being awarded a Gold Disc. When Brian died in 1994, he was described by Daily Telegraph as "the greatest natural broadcaster of them all". The book was first published in 1996 and contains all the material from the original recording as well as additional stories from his second and final tour. Brian's skill and warmth as a master raconteur shine through on every page as he recalls his early years at Eton and Oxford, his war service with the Grenadier Guards, and his remarkable broadcasting career at the BBC. 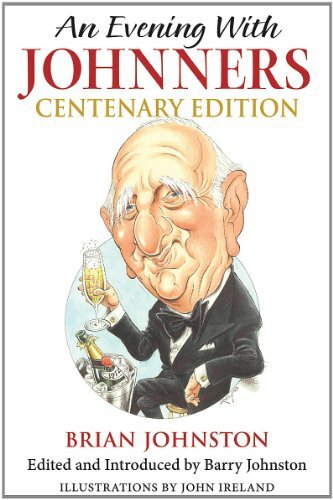 This centenary edition has been updated by the editor, Brian's eldest son Barry Johnston, and includes new illustrations by John Ireland. Barry Johnston appeared with the vocal group Design on more than fifty TV shows in the 1970s, such as Morecambe and Wise, Benny Hill and The Two Ronnies. He presented the breakfast show on KLOA-AM in California and then presented a daily show for many years on BBC Radio Sussex. He now runs Barn Productions and has produced more than 100 audiobooks, including the number one bestsellers 'An Evening with Johnners' and 'The Wit of Cricket'. He has also edited and compiled several books including the Sunday Times top ten bestseller 'Letters Home 1926-1945', 'The Wit of Cricket' and 'The Wit of Golf' and is the author of biographies of Kenneth Horne and of his father, Brian Johnston.